The Bengal cat breed began in 1963, and they are descended from crossing the wild cat known as the Asian Leopard Cat, (a small, forest-dwelling cat found in Asia and India), and domestic shorthair cats such as Abyssinians, American Shorthairs, Burmese or Egyptian Maus. The goal of the Bengal breed was to create a domestic cat which has the physical features distinctive to it's wild ancestor, but with the loving dependable temperament of the domestic cat. 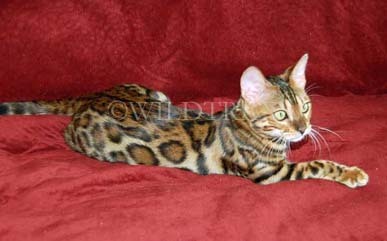 The best companion Bengals are at least four generations removed from the Asian Leopard Cat. Most pet Bengals are wild only in looks, not in personality. An SBT (stud book tradition) Bengal represents at least five generations or more of Bengal-to-Bengal breeding, and thus will be no less than five generations removed from wild blood. The SBT Bengal is considered to be a fully domestic cat. 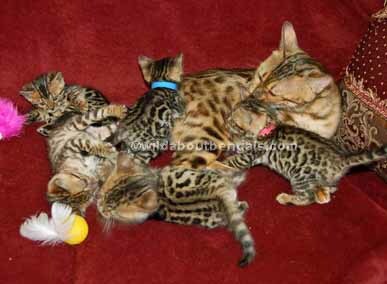 F1 through F4 (foundation) Bengals are anywhere from one to four generations away from the Asian Leopard Cat. (first, second, third, and fourth generation removed from the wild.) 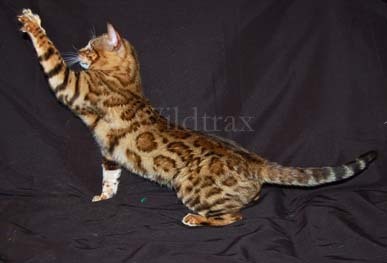 A F1 Bengal is the result of a Domestic Cat-to-Asian Leopard Cat breeding creating a 50% wildcat cross, an F2 is the result of breeding a F1 Bengal to a SBT Bengal creating a 25% wildcat cross, An F3 would be the result of breeding an F2 and SBT together, and so on). An SBT cat would thus be at least an F5. Most pet Bengals are SBTs; cats with more wild blood than that may make difficult pets. F1 through F4 Bengals may also be illegal in some cities, counties, or states because of their higher percentages of wildcat blood, while SBT Bengals are not in most cases. The Bengal cat is a medium to large, sleek and well muscled cat, with hindquarters slightly higher than shoulders. Female Bengals average from 7 to 10 pounds at maturity, and males can average from 12 to 16 pounds at full growth. 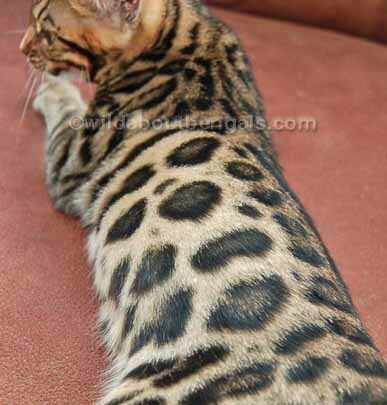 The body is long and very muscular, resembling the Asian Leopard Cat's powerful appearance. The head is a broad modified wedge-shape and is longer than it is wide. Large almond-shaped eyes, set wide apart, and short rounded ears enhance the "wild" look. 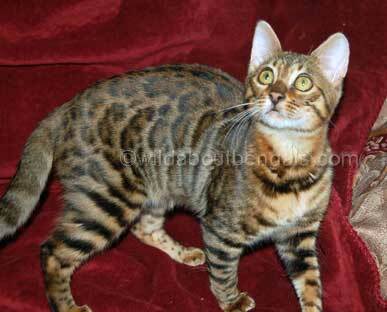 The Bengal's glossy luxurious coat is short with a thick unusually soft texture. Bengals do not shed as much as other breeds, and their coats require no special care. The coat is patterned in random spots or marbled, with a variety of acceptable colors. Like snowflakes, no two Bengals have the same pattern. Bengals are most commonly seen in the "brown spotted" (aka BST) or "leopard spotted" pattern, which encompasses a wide range of colors. The spots can be black, brown, tan, chocolate or cinnamon and contrast with the background color. Glittering refers to an effect on the coat that makes it looks as if the coat was sprinkled with glitter. Rosetted refers to the spots forming distinct patterns, preferably with more than one color tone within the spot. Vivid markings with sharp contrast of colors is the mark of a show Bengal. Seal sepia, seal lynx, and seal mink, color patterns with a pale white or cream background, are popularly referred to as "Snow" Bengals. The most recent new color accepted for bengals is Silver, with black spots on a dove grey background. Occasionally Blues and Charcoals are found, but these are not accepted colors for the breed currently. Bengals are lively, energetic cats with a healthy dose of feline curiosity. Graceful, strong, and agile, Bengals love to climb and will gravitate to the highest point in any room. 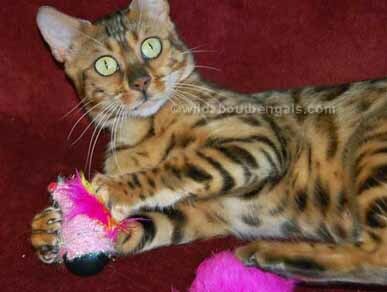 Almost uncannily intelligent, Bengals learn quickly and can be taught a number of tricks, such as playing fetch. In fact, some learn tricks you'd rather they didn't, such as opening cupboards, turning on and off light switches and flushing toilets. Well-bred Bengals are active, playful, affectionate, family companions. Bengals are very affectionate and like to give you "headbutts" as a greeting, along with lots of leg rubs. Some Bengals can be very talkative. Bengals love water, and will splash in the sink or toilets, or even jump into the shower with you. Bengal owners find that they are very "dog-like" in personality, following you from room to room and always greeting you with a loving welcome. The Bengal also mixes well with children and other animals. 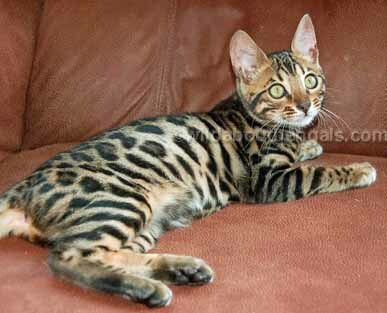 Bengals are generally a healthy breed if you purchase from a reputable and responsible breeder, and they don't require any specialized care. Bengals are subject to the same feline diseases as all cats, and health care is no different than any domestic breed of cat. They do seem to have sensitive digestive systems, so they do not do well on varied diets. Varied diets tend to give them the runs or soft stools, but to avoid it, you just simply keep them on a strict diet of the same brand of food all the time and do not switch brands of food randomly. (no table food scraps!) I find they are much healthier all around if I keep them on a high quality all natural food with no corn or wheat products in it. There are many good brands out there, so you can do research on the different foods on the internet and choose a good one, there's no one real "magic" or best food out there. Like many baby wild animals, all Bengals go through an ugly duckling stage called the "fuzzies", where they lose the clarity of their markings before later regaining them with their adult coat. 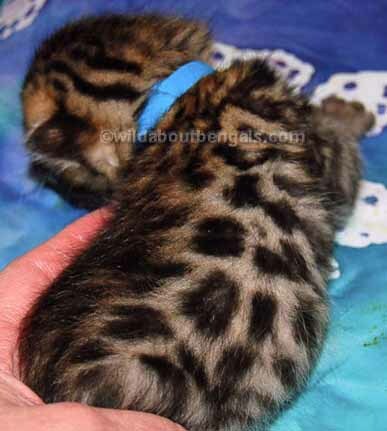 Shortly after 2 weeks of age, Bengal kittens develop a long coat of "guard hairs", usually black or dark gray, that pretty much obscures their dramatic spotted appearance. The guard hairs can mute their markings, especially from the front view, so their color and pattern can be difficult to distinguish. You can usually look at their coats from behind to see their coat pattern a little better during this stage. Unfortunately, the "fuzzies" are at their worst at about ten weeks old, when kittens are first ready to go their new homes. This is quite normal. They typically shed their kitten coats somewhere around 16 to 25 weeks of age, but it varies from one individual kitten to another. Is A Bengal Right For You? Bengals form strong, emotional bonds with their human friends, and become loving, loyal companions. Because of their deep attachment to their humans and their high activity level, they need more human interaction than some breeds. If you're away all day and have an active social life at night, another breed might be a better choice. 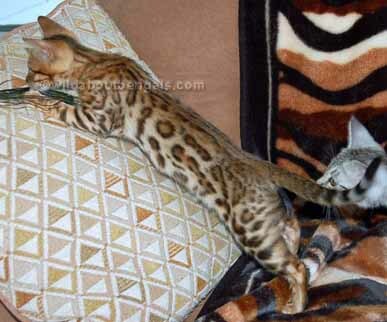 Young Bengals are quite hyperactive and excitable and take a few months to learn their manners. They have energy to spare, and seem to have two modes; the "ON" mode, when they tear round the house, leaping, and climbing, and the "OFF" mode, when they flop into an exhausted heap. Two Bengal kittens will exercise each other far more effectively than you can, and will love having a constant playmate should you not be in the house all day. Bengals that don't have an outlet for all their energy can get into trouble or mischief around the house during your absence. You can also find more info about the Bengal breed on our FAQ page and be sure to check out our Breed Comparison Chart if you need help deciding on which of our breeds is the best fit for your family. After you have researched more about the bengal breed, if you are still unsure if a bengal is right for you, please contact us and we will be happy to help evaluate your home for compatibility with a bengal.